Stir-frying brings out the distinctive, herby taste of "shungiku," an edible chrysanthemum green and one of the most prized greens in Japan. Packed with B vitamins, potassium, and other minerals, t's one of our favorites here at the farm. (3) Scramble the eggs and remove from pan. (4) Heat the other half of the oil and saute shungiku until half-tender (about 2 minutes). 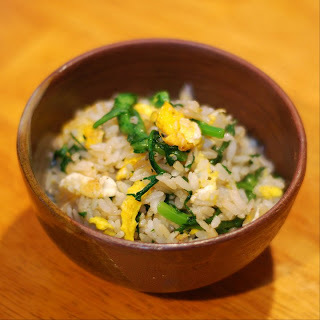 (5) Add rice, hondashi, salt, egg, and saute for 2~3 more minutes. Soy sauces burns easily, so don’t cook it long. Chicken or vegetable stock may be subsituted for hondashi.